There is growing concern over the dwindling numbers of veterinary surgeons currently practising in the UK. Many vets are leaving the profession to take up better paid positions as hairdressers or butchers. At the same time, there is less and less new blood coming into the field, a fact which is blamed on the many years of training and the unnecessarily stringent examinations needed to obtain a veterinary licence. The final exam requires students to assemble a fully functional cat from a variety of spare parts, and candidates can often fail on the simplest of things, such as getting a spleen in the wrong place. However, a radical new rethink is set to encourage more people to become vets. To make the profession more accessible the test will be made much easier. 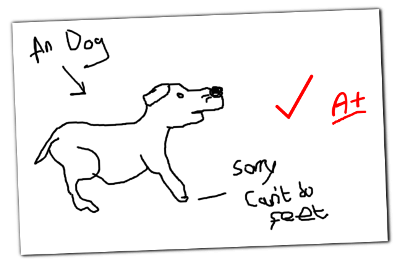 In future, students will be required to draw a picture of a dog with a felt-tipped pen, and we understand that even those that only display a passing resemblance will pass.